Quick Study: Ludmila Ulitskaya is one of Russia’s most popular and celebrated writers: she is known for creating vivid characters who populate fiction that is set in the Soviet and post-Soviet eras and often includes elements of history and science. The Ulitskaya File: Ludmila Ulitskaya came to writing fiction relatively late in life but her debut in long-form fiction was auspicious: her first novella, Sonechka, was published in the literary journal Novyi mir in 1992 and nominated for the 1993 Russian Booker Prize. Ulitskaya went on to publish Medea and Her Children and The Funeral Party in Novyi mir; Medea was shortlisted for the Russian Booker in 1997. The Kukotsky Case, also published in Novyi mir, won the 2001 Russian Booker and Daniel Stein, Interpreter, a novel that blends fact and fiction, won the 2007 Big Book Award and was shortlisted for the 2007 Russian Booker as well as the Russian Booker of the Decade. Ulitskaya has written plays that have been staged in Russia and Germany, and some of her novels have been adapted: The Funeral Party and The Kukotsky Case were adapted for screen and the novel Sincerely Yours, Shurik, was staged in Hungary. In the 2000s and 2010s, Ulitskaya released several compilations of stories, plays, and nonfiction: they include books for children about tolerance and patience as well as Discarded Relics, a book of essays and reminiscences that reflect on life and death, including an account of fighting breast cancer. Ulitskaya’s correspondence with Mikhail Khodorkovsky, the former head of Yukos who was sentenced to prison for financial crimes, was published in 2009 by the journal Znamia, which awarded them a prize. Ulitskaya’s books have been published in translation in over two dozen countries. Ulitskaya Recommends: In an interview with Russian Newspaper in February 2011, Ulitskaya discussed her respect for Lev Tolstoy, saying “I love his books, the big novels and the little stories, for example the brilliant story ‘Alyosha the Pot’.” She also called Tolstoy a “great commentator on Russian history,” saying she reads and rereads his War and Peace. In a 2012 interview with the magazine Medved, Ulitskaya mentioned enjoying works by anthropologist Bruce Chatwin. 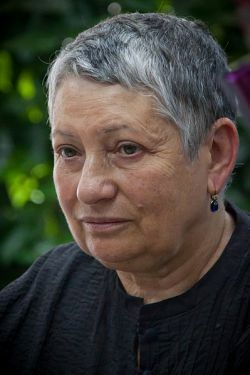 Ulitskaya has also won many European literary prizes and nominations as well as the 2011 Prix Simone de Beauvoir pour la liberté des femmes.